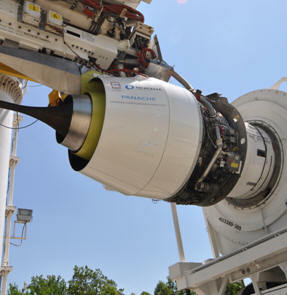 July 9, 2012 - Nexcelle, the nacelle systems joint venture of GE’s Middle River Aircraft Systems and the Safran group’s Aircelle, has completed a successful test program for the advanced thrust reverser element of its next-generation Integrated Propulsion System (IPS) technology. The thrust reverser was validated with Nexcelle’s new nacelle demonstrator, called PANACHE (Pylon And Nacelle Advanced Configuration for High Efficiency), which logged a combined total of more than 47 hours in operation on Test Stand 3E at GE Aviation’s Peebles, Ohio facility. PANACHE was installed on a CFM56-5C jet engine, which represents one of the propulsion system categories for which Nexcelle is developing its integrated nacelle designs. Test runs with PANACHE involving 200 cycles representing normal deployments, rejected takeoff deployments and aborted landings were completed a week ahead of schedule, demonstrating the maturity of Nexcelle’s IPS design and hardware. Key elements of Nexcelle’s advanced thrust reverser configuration include a one-piece composite O-Duct, which replaces the two-piece “D” doors on a traditional thrust reverser. With the O-Duct’s continuous composite structure, the IPS’ thrust reverser benefits from reduced weight, while also eliminating the D-doors’ bifurcation in the flow-path increasing the thrust reverser’s efficiency. Another unique characteristic is the new thrust reverser’s kinematics, in which the entire O-Duct moves aftward to the reverse thrust position, thereby eliminating the need for drag links in the secondary flow-path. Added to these advantages is Nexcelle’s application of an electrical thrust reverser actuation system (ETRAS) a major improvement that employs electrically operated actuators instead of the hydraulic system actuators used in current-generation engines. Benefits of ETRAS include enhanced reliability, reduced weight, and improved maintainability with these attributes validated in service on the A380. The PANACHE demonstrator’s elements have been returned for detailed hardware inspection to Aircelle’s Le Havre, France headquarters location and to the Middle River Aircraft Systems production site in the U.S. state of Maryland. Initial verification of PANACHE at the conclusion of testing showed the hardware to be in excellent condition. Nexcelle is developing Integrated Propulsion System nacelle configurations for two programs: CFM International’s LEAP-X1C engine on the COMAC C919 jetliner; and GE’s Passport, which will power the Bombardier Global 7000 and 8000 business jet aircraft. Nexcelle is creating smart nacelle systems for tomorrow’s world travel. Headquartered in Cincinnati, Ohio, USA, the company is a 50/50 joint venture of Aircelle and Middle River Aircraft Systems (MRAS), which are leading suppliers of engine nacelles, thrust reversers and aerostructures. Through Nexcelle’s relationship with CFM International, GE Aviation and Safran, the company brings unparalleled expertise in the design, development, production and support of integrated propulsion systems for a wide range of aircraft.